One of the best places to visit to take in a spectacular sight while you relish on good food, the UFO observation deck is a must when in Bratislava. Take a few hours out to simply unwind at the 7th largest hanging bridge in the world and you will surely enjoy all the city lights, fine flavors and a bird’s eye view of the city’s charming landscape. Panoramic view of the city while you have a drink! You don’t pay in case you visit the restaurant: you usually need a reservation for the restaurant, mainly during the weekends. Love this? Explore the entire list of places to visit in Bratislava before you plan your trip. Fancy a good night's sleep after a tiring day? 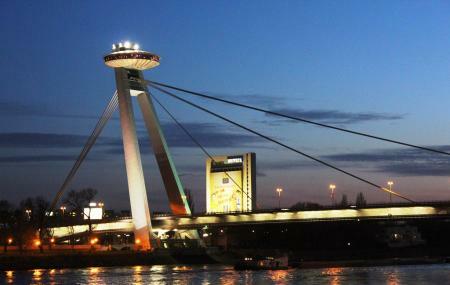 Check out where to stay in Bratislava and book an accommodation of your choice. How popular is Ufo Observation Deck? People normally club together Bratislava Old Town and Napoleon's Army Soldier Statue while planning their visit to Ufo Observation Deck. Great view, and the food and drinks are great, even if they are on the pricey side. You can go up above the restaurant to get an open-air viewing experience, which is very cool and memorable! The staff have always been kind and helpful. Very professional, the bartender knew my favourite drink even when it wasn't on the menu. So happy to go there, reservation is advised, prices could be a little lower but don't let them stop you from going. Also the bar has a burger and the restaurant has a different menu then the bar. Definitely recommend going, also if you reserve the restaurant you don't pay for observation deck. Although drinks, ambience and view of the city was nice, the staff weren't particularly friendly in the restaurant, possibly because we were obviously tourists. They refused to use the 10% discount code the lady on the ground floor had given us and didnt want us to drink when sat on a sofa there. It was a bit confusing. I would still recommend as a one off and hope you receive more warm service. Great panorama view while dining. Lunch time menu is good and reasonable. Great lookout especially when it is sunny.